Back when I was young, there was this TV commercial in the Philippines of a school boy reciting a poem about kangkong (water spinach) which became so popular with the tagline, "Ang Kangkong, Bow". That commercial was one of those launched by the Philippine Department of Health in its effort to promote healthy eating among school children. It specifically tells about the nutritional benefits of kangkong --- how rich it is in Vitamin A which is needed for good eyesight. Kangkong wasn't one of my favorites...and that commercial was like a wake up call for me. I was only in grade school that time, and my mom was already wearing eye glasses. She couldn't read nor sew without it...and I knew that I don't want to be like her. I always want a 20/20 vision so I told myself if that's what I want, I better eat lots of kangkong...and that's what I did! Little did I know that time that the Vitamin A content of kangkong is actually very little which is only 2.9 mg per 100 g. Oh well, no regrets! I'm still thankful to that commercial...at least I learned to eat kangkong which is rich in protein, calcium and Vitamin C, though not as rich in Vitamin A as I expected it to be. This is a very simple and easy way to enjoy this nutritious greens...all you need is soy sauce, vinegar, garlic and onions. Just do a little sauteing and you'll have a delicious and healthy vegetable dish in no time. I usually cook it with ground pork just to encourage my daughters to eat it...but it can be cooked with no meat at all. It can be served with rice and fried fish/meat or with rice alone. 1. In a pan over medium heat, saute garlic in olive oil until light brown. Add onions and saute until translucent. Add ground pork. Saute until there's no more red part showing. Cover and simmer for 5 minutes or until ground pork is cooked. 2. Add kangkong, soy sauce and vinegar. Simmer for 3 minutes. Add salt and pepper to suit your taste. Remove from heat. Serve with hot rice. Nice recipe Tina,wished to try adobo,now will try this recipe, sounds healthy too. So Asian and we love this very much. I can eat rice with this stir fried kangkung. Because my other half does not eat pork, I use dried prawns but the rest of the ingredients is almost the same. You gave me a reminder that I should make this for the weekend. Been ages and I am missing the kangkung now. We can get here easilly adobo from chinese grocery. This simple green has awesome taste. Love it dear. Greens always makes the meal perfect. Love this simple dish Tina. 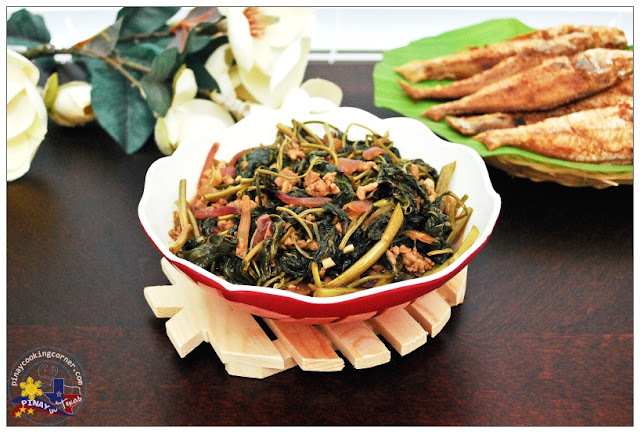 I love kangkong especially if it's adobo style. The flavor of adobo compliments the crunchyness of thie vegetable. Sarap with lots of kanin. Have a blessed weekend, Tina! I love quick meals like this - it has veggies, meat, and all you need is rice right? :D Looks very good! 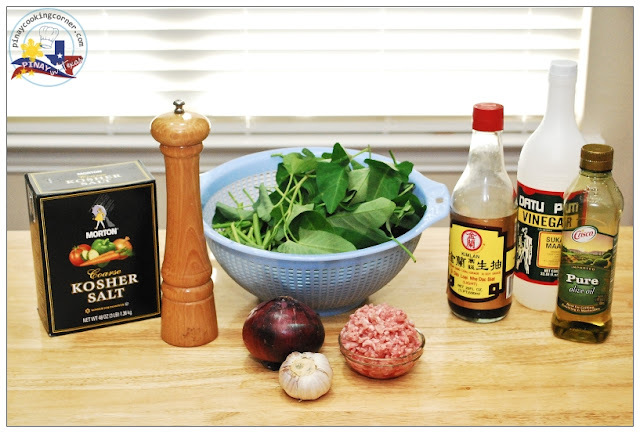 I buy water spinach once in a while, I'll remember to try this recipe! A wonderful meal that would certainly convince many spinach haters. I have never had water spinach but I think I have seen it in my Vietnamese shop here (or maybe I'm wrong). It's incredible that whatever the spinach, children hate it all around the world! I love a meal where everything is all in one dish! This looks amazing! Have a fabulous weekend! It's amazing that just those few ingredients turned out such a complex and delicious looking dish. I buy spinach all the time and have this recipe on my "to-make" list. I need to find a source for water spinach. I've seen it over at Ray's and like here, it sounds so delicious. I love what you did with it have making it an adobo! What an easy, healthy and tasty meal! A typical Filipino viand yet it looks so good! Tina, you have cooked these kangkong very well. This looks delicious. Yum! Being Asian, kangkong is one of my fav vege too but it can quite rare and available at warmer seasons only in Australia. this is a wonderful dish but I have never heard or seen water spinach. Hi Tina, delicious kangkong dish. 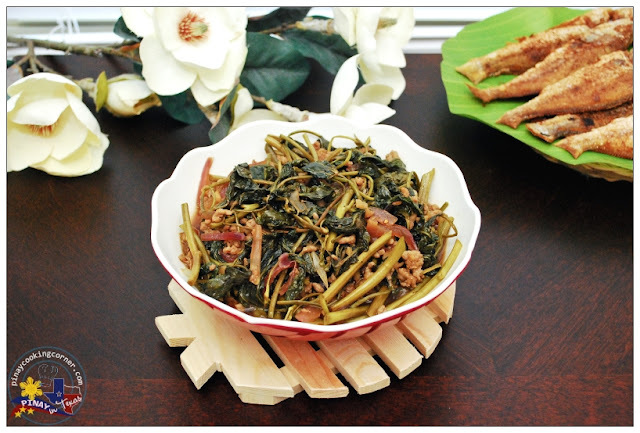 I love kangkong too but cook in spicy style or stir fry with fermented beancurd.